Clitocybe odora, the aptly named Aniseed Funnel Cap, is more easily detected by its scent than by its appearance - indeed, it is often buried deep under bushes where it is difficult to spot visually. Other mushrooms have a similar aniseed odour, but none is as powerfully scented as this beautiful woodland mushroom. 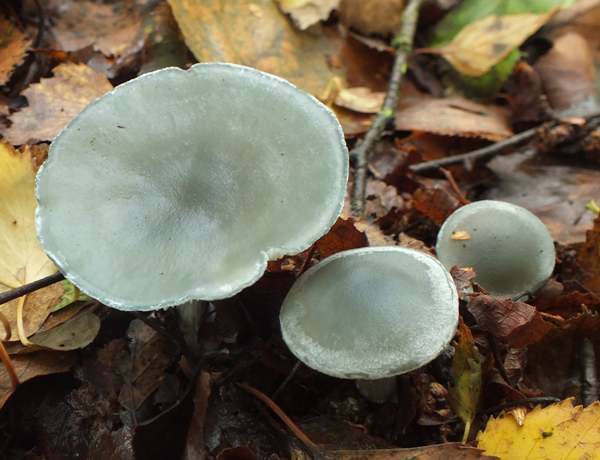 A startling sight when young and fresh, the lovely pale blue colour of young specimens soon fades towards light grey. It comes as quite a surprise to find your first blue mushroom. 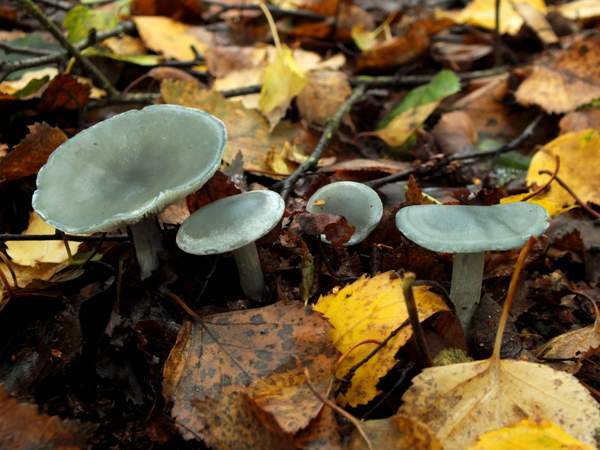 Not only that, but so little of what is blue in Nature is adible, and yet this particular fungus is quite highly regarded by those who know about edible wild mushrooms. The Aniseed Funnel, as it is now called in the official list of English Names maintained by the British Mycological Society, is a beautiful mushroom; it was previously more often referred to in Britain as either the Aniseed Mushroom, Aniseed Toadstool or Aniseed Funnelcap. Rarely does Clitocybe odora occur in groups of more than half a dozen specimens, and more often than not the fruitbodies are solitary. Fairly common and widespread throughout Britain and Ireland, the Aniseed Funnel also occurs in most temperate parts of mainland Europe and in Asia and in many parts of North America. It was the German mycologist Paul Kummer who, in 1871, transferred this species to the genus Clitocybe, at which points its scientific name became Clitocybe odora, which is still its generally accepted scientific name today. Synonyms of Clitocybe odora include Agaricus odorus Bull., Gymnopus odorus (Bull.) Gray, Agaricus trogii Fr., Clitocybe viridis (Huds.) Gillet, Clitocybe trogii (Fr.) Sacc., and Clitocybe virens (Scop.) Sacc. 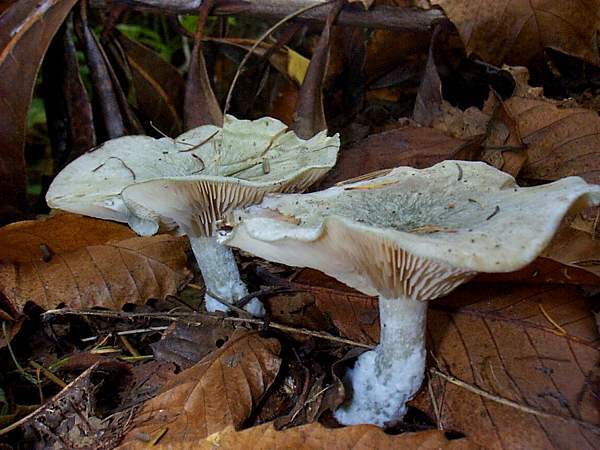 The generic name Clitocybe (usually pronounced 'klite-oss-a-bee') means 'sloping head', while the specific epithet odora is Latin for 'perfumed'. Young fruitbodies of Clitocybe odora are quite striking... both visually and in terms of their strong aniseed scent and flavour. The colour soon fades, but the strong odour and taste remain. 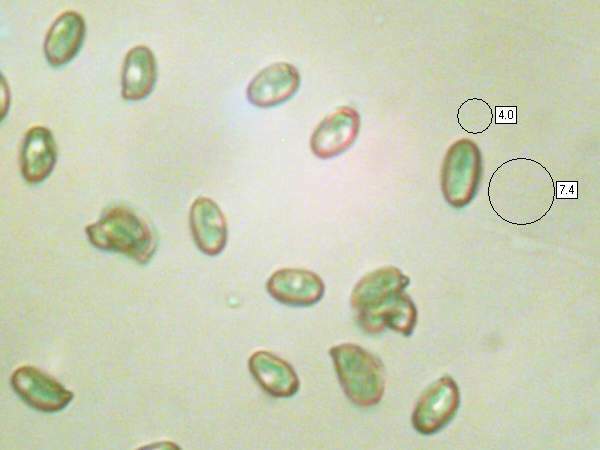 Once again, as if it was needed, the fungus world reminds us that gill colour is no guide to the colour of the spores. Like so many other members of the family Tricholomataceae, the spore print from this species is almost pure white. 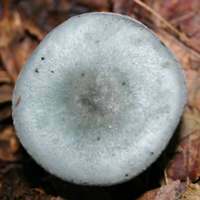 3 to 8cm in diameter, blue-green at first but fading towards pale cream; smooth and non-greasy; convex, later flattening and eventually becoming funnel-shaped with a wavy margin. The cap flesh is white, thin and very tough; edible but best dried and used as a flavouring. 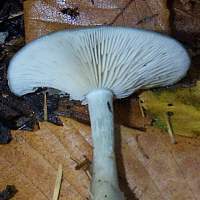 Paler than the cap surface, the gills are adnate or slightly decurrent, fairly broad and moderately spaced. Like the cap surface, the gills also pale with age. 5 to 10mm in diameter and 4 to 6cm tall, the stem is silkily fibrous and is covered in fine white downy fibres towards the slightly swollen base. Ellipsoidal, smooth, 6-9 x 3.5-5.5µm; inamyloid. Strong odour and taste of aniseed. In Britain and Ireland this mushroom is saprobic on broad-leaf litter, mainly under beech trees, and very occasionally under conifers. In some parts of North America the Aniseed Funnel is most commonly recorded under conifers, although in many other areas it favours oaks and other broadleaf trees. 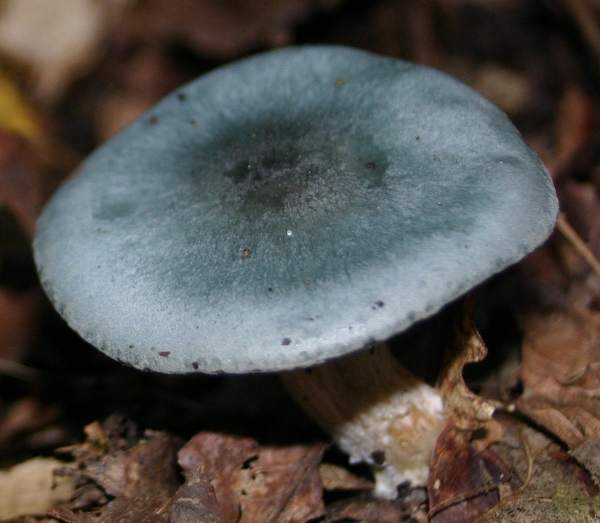 Stropharia caerulea has a greasy greenish-blue cap when young and its surface is covered in scales, especially near the margin; it does not smell of aniseed. Clitocybe odora is a good edible mushroom and can be used either fried with onions or in risottos, soups and many other mushroom dishes. The aniseed flavour is said to be particularly good when these mushrooms are made into a sauce to go with plaice, cod or other kinds of white fish. 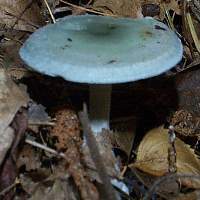 Pale specimens could be confused with suspect species such as Clitocybe fragrans, and so it is advisable to collect only fresh blue specimens for culinary use, slicing them vertically to check that they are not infested by maggots. An easy mushroom to dry, the Aniseed Funnel is sometimes powdered and used as a condiment. Rapior, S., Breheret, S., Talou, T., Pélissier, Y. & Bessiére, J.-M. (2002). The Anise-like Odor of Clitocybe odora, Lentinellus cochleatus and Agaricus essettei. 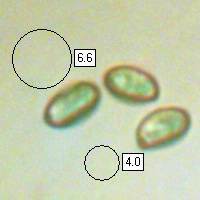 Mycologia 94(3): 373-376. Taxonomic history and synonym information is drawn from many sources but in particular from the British Mycological Society's GB Checklist of Fungi and (for basidiomycetes) on Kew's Checklist of the British & Irish Basidiomycota.